WASHINGTON (Reuters) --The director of central intelligence, George Tenet, has ordered U.S. spy outfits to turn commercial satellite images into the mainstay of government mapping, rather than spy satellites. The policy, a shot in the arm for the fledgling U.S. remote-sensing industry, would leave the government's own high-resolution satellites free for spookier work. "My goal in establishing this policy is to stimulate, as quickly as possible, and maintain, for the foreseeable future, a robust U.S. commercial space imagery industry," Tenet said in a June 7 memo to James Clapper, head of the National Imagery and Mapping Agency. U.S. commercial satellite imagery should be "the primary source of data used for government mapping, regardless of whether the production work is performed by NIMA or is outsourced," he said. Among the potential beneficiaries is Boeing Co., which is developing a "Future Imagery Architecture" for the National Reconnaissance Office, a secretive Pentagon contracting agency that designs, builds and operates spy satellites. Tenet's order, first reported by The New York Times, was obtained by Reuters on Wednesday. CIA spokesman Mark Mansfield confirmed its authenticity. In it, Tenet also told Clapper to streamline the acquisition of commercial satellite imagery for other federal agencies in an effort to expand the market. NIMA is one of the 13 executive-branch outfits that make up the U.S. intelligence community. 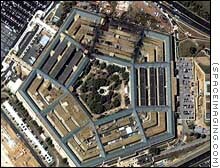 A Defense Department arm, it manages the collection of imagery and mapping for combat commands, the CIA, the Defense Intelligence Agency and other spy agencies. In line with rising pressure from Congress, Tenet said it was U.S. intelligence community policy to use U.S. commercial space imagery "to the greatest extent possible." "National technical means" -- spy jargon for satellites and other sensors used to collect classified data -- will be used to collect mapping data only in "exceptional circumstances," added Tenet, who serves as board chairman of the intelligence community in addition to heading the CIA. The Senate Armed Services Committee included $30 million in its version of the fiscal 2003 defense authorization bill for purchase of commercial imagery, imagery products and services from U.S. commercial vendors. The panel, in a report accompanying the bill, asked NIMA to establish a "concrete plan" incorporating a role for commercial remote-sensing capabilities in the Boeing-developed "Future Imaging Architecture." NIMA did not respond to a query about how much business the policy change might spin off. Clapper, a retired Air Force lieutenant general, told reporters this month that the Bush administration had earmarked a "substantial increase" for purchasing commercial satellite images in coming years. "We as a nation, I believe, are committed to a very strong, viable internationally dominant commercial imagery industry," he told a June 4 defense writers' breakfast. In the early days of the U.S.-led war in Afghanistan sparked by the September 11 attacks, NIMA bought exclusive rights to all imagery collected over the region by Space Imaging of Thorton, Colorado -- a practice critics denounced as "checkbook shutter control." Space Imaging, which in 1999 launched Ikonos, the world's first one-meter resolution commercial Earth-imaging satellite, hailed the move toward integrating products like its own into the government's day-to-day operations. "If this directive is implemented it would stimulate and maintain a robust commercial industry which the Congress and several administrations have sought to do for a long time," said Mark Brender, Space Imaging's executive director for government affairs. Other potential beneficiaries include ORBIMAGE of Dulles, Virginia, and DigitalGlobe of Longmont, Colorado, which began marketing .61-meter resolution images worldwide this month.